I know I'm preaching to the choir here, of all places, about miscommunication and its affect on, well, EVERYTHING. Family get-togethers that include my husband AND mema usually have something along this line happen: mema says something (anything), husband says “oh, but that's not actually correct, it's this...”, mema doesn't understand the correction only that she's being corrected and she considers the gauntlet thrown and she will not be defeated, husband didn't intend this reaction (debatable, if you ask me), but he will not be defeated either, so they continue back and forth. Really, you guys? Husband – she has no idea what you're talking about & you're fully aware of that, doesn't that mean, on some level, you already won? Just shut up & celebrate in silence. Mema – you have no idea what he's talking about, so why are you arguing an argument for which you have no basis to argue? Just ignore him entirely, go poke the baby & enjoy at least ONE moment in life. 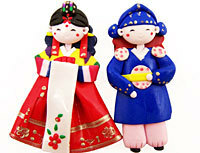 Happy mother's day to all the Kimchi Mamas out there! May your day be filled with laughter, joy, hugs, smiles . . . and of course, kimchi! -Angie in Texas will be celebrating with her Kimchi Mama with . . . kimchi! Last time my mother-in-law was here, I was not quite myself. I had been living with my mom for about a year by then and she was literally driving me crazy. Her constant nagging and criticizing to her taking over the house and putting everything where she wanted, etc... was slowly chipping away at my sanity. So, when my MIL was visiting, I was not the perfect hostess that I would have otherwise been. (Who am I kidding, I would NEVER be the perfect hostess.) But yeah, the last LAST time she was here, she seemed to like me enough and I think she had a good time even though the jet lag and plane ride was taxing on her frail health. A Penny for Your Name? My MIL called a couple of days ago and unfortunately, I was napping so the hubs answered the phone. When I woke up, he informed me that our second son's Korean name was Hyung Ooh. Interesting. I didn't like it or dislike it all that much... but it didn't roll off the tongue as much as I wanted it to. And I also wanted our second son's name to have at least one same syllable (why does that spelling look so wrong?) as our first son. First son's name is Jung Ho. Since MIL lives in Korea and doesn't have much "say" in our day to day lives, I thought it'd be nice to have her name our children... their Korean names I mean. Hubs and I decided on the English names together without input from any grandparents. Actually, it wasn't exactly her who gave our boys their Korean names. She went to a "place." I don't even know what it's called in Korean. When I translate to the hubs, I call it a wise man or a fortune teller. Anyway, she goes there and tells them the date and time of the birth... and I'm not sure what other information, and pays a certain fee and voila, the wise man names the kid. I should totally totally be sleeping right now since I've gotten like 10 hours of sleep for the past week (newborn at home) but I have this overwhelming urge to write. Oh yeah, so, I had a baby boy. Please welcome Aiden. As some readers might know, I don't have a very good relationship with my mom. When I had the baby, I gave her a call, informing her of the news... just because, well, she is my mother. A recent disagreement I had with my mom is prompting me to think about what contact, if any, is appropriate between mothers and MILs. Does your mom and your MIL have a lot of contact? Do they get along? Do they talk on the phone? Do they meet up? My mother and MIL talk on the phone occasionally and have met at least 5 times. Twice in the US and the rest in Korea, without me. My MIL NEVER says anything unpleasant to me, but my mom tells me of some things she told her about me, or somethings that my mom told my MIL and some of this stuff makes my blood boil. About a month after my brother got married, I saw a side of my mother I had never seen before. It started with my brother and his new wife's second visit to our house after returning from their honeymoon. During the visit, everything seemed fine. We hung out, had dinner with the requisite fruit and coffee afterwards, and watched a little tv. Then my brother and his wife left with bags full of leftovers and other dishes my mother made especially for the newlyweds. But after they left, the grumbling started. Why did she sit on the couch all evening, Why didn't she do the dishes, Why am I serving her, Why can't she get her own cream and sugar, Who does she think she is, a guest?, Is she going to keep coming over demanding service? Whoa. What happened to my usually reasonable and generous mother? So. I'm still here. Still pregnant. Still waiting. This third pregnancy has been subsequently harder than the first two - physically, I"m a wreck and I'm a ball of hormonal rage (you should feel badly for all those around me. Very badly. heh) but there's one big thing that will be different this time around - My Mother-in-law won't be here to help me afterwards. My Big Fat Korean Wedding? What would it take for this to be a white American woman and a Korean man, huh? I took the easy way out of negotiating wedding traditions - eloped to Vegas, baby! What kinds of comedy/horror stories have you experienced around Korean weddings?